Cadair Idris Nature Reserve at Cadair Idris (NRW)0300 065 3000work Nature ReserveCader/Cadair Idris is a spectacular mountain reserve with a variety of landscapes and terrain. Rugged summits, glacial lakes and a mossy wooded gorge cover over 450 hectares of breathtaking landscape. 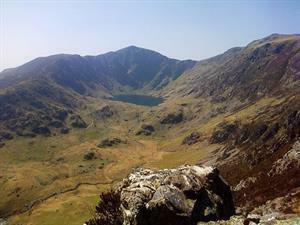 The Nature Reserve lies within Snowdonia National Park and is part of the Cadair Idris Special Site of Scientific Interest (SSSI) and Special Area of Conservation (SAC). Dôl Idris is a beautiful parkland on the foothills of Cadair Idris in the south of the Snowdonia National Park. The site has around ¾ mile of accessible path to take you around the parkland, going past a picturesque little lake and its fish ladder, exotic trees and the remains of a soft drink laboratory! The reserve encompasses the mountain and lower slopes, with a variety of habitats of European importance. These include dry heath, wet heath, blanket bog, woodland and the species-rich marshy grasslands of Tir Stent common, as well as a number of low nutrient or clear-water lakes. The cliffs support tall herbs growing on the ledges, and a range of plants growing on rock crevices. These habitats support a wide range of species, including slender green feather-moss and marsh fritillary Butterfly. While the romantically inclined attribute its features to the work of giants, geologists come up with more prosaic but nonetheless interesting explanations that span hundreds of millions of years. The origin of the rock is volcanic, some of the lavas being poured out under the sea and shaped into bulbous "pillows" that give it the name pillow lava. These are interspersed with layers of ash and other sediments that settled out on the sea bed of the time. Amongst this craggy country on the mountain tops there survive rare Arctic/alpine flowers, a legacy of the last Ice Age such as purple saxifrage and least willow (a 'tree' that never gets to more than a scrambling shrub).